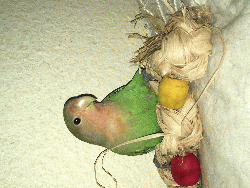 Hi I am Sweet Pea and while I may be sort of gimpy my foster mom says I take the award for "cutest bird ever!" I have some disabilities with my legs (slipped tendon in right knee and left foot turned in at ankle plus loose hips) and was surrendered with my mom and dad to the humane society. Oh boy that was traumatic! I am now in a great place and have special flat perches to help me climb and rest and have recently found `under the towel` to be an awesome thing! Don`t let my legs fool you, I can get around pretty good even if I do sort of crawl like a bat! It`s a good thing my foster mom thinks bats are super cute too! I am still sort of scared by those human hands coming at me but I have done much better and am learning to step up in my own special way.I eat Roudy Bush Pellets and sometimes Harrision`s pellets along with some dried greens. Mom is trying to get me to eat fresh greens and veggies but I like to make a art with them instead! Such pretty colors! I do need someone who is patient, will talk softly to me and moves slow when picking me up or cleaning my cage. I do like to cuddle under the chin and cupped in a hand or wash cloth and I am quiet the chatterbox! I even say a few words and have learned a lot of whistles! If you think I am a good fit please contact the Lovebird coordinator. Make sure to ask for Sweet Pea! !Tweet chirp!